Oil has been making headlines for weeks, and many pundits have rushed to explain, in retrospect, its stunning decline in price and how it impacts other markets, including U.S. stocks. Only problem is, someone not only anticipated it; they put it in writing. Our friends at Elliott Wave International called for an all-time high in oil in June 2008, six years ahead of these explanations. That was when oil was at $140 per barrel, nearly three times its price today. In May 16, 2014, they published an oil chart (see below) with the headline "Deadly Combination." It landed at a time when no one else was talking about oil like they are today. On the contrary, 91% of traders were actually bullish on oil at the time, and Large Speculators had their biggest long position EVER. "… the multi-year outlook is for much lower prices." 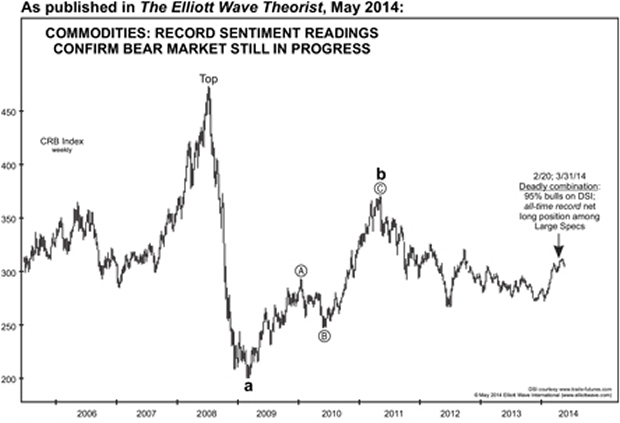 "Wave c should carry the price of oil below the 2008 low." The 2008 low is $34.50. As I write you this letter, oil is down 4% on the daily session and priced at $48 per barrel. Meanwhile, gas prices are dipping below $2 per gallon nationwide. Compare that to the time of Prechter's 2014 forecast, when oil was TWICE today's price -- at about $100 per barrel. Here is the updated version of the above chart -- with today's prices. A quick glance shows how far oil has fallen: more than 50%. But Bob and his team have a lot more to say -- on stocks, gold, interest rates, currencies, economic trends and more. And if it is even half as accurate as their forecast for oil, it will pay off right now to lean in and listen. Which is why we are excited to invite you to join us for EWI's upcoming free event: The State of the U.S. Markets Online Conference. EWI has just released their much-anticipated annual report for subscribers, The State of the Global Markets -- 2015 Edition. And to celebrate the months of hard work put into pulling it off, they're inviting the public to come and preview the U.S. section of it -- 100% free -- plus brand-new videos and bonus resources from EWI's top analysts. From now until Jan. 28, you can read and watch as Prechter and his team lay out their big-picture forecasts for the U.S. markets. Forecasts they expect to unfold over the next 12 months and beyond. This is an incredibly valuable event -- not only because it gives away months of EWI's high-priced research for free; because it represents a full year's worth of opportunities from more than a dozen of the world's top financial analysts. Please tune in to this event. You can bet we'll be checking in daily as new resources go online. Click this link to claim your free invitation now. P.S. The event officially begins Jan. 20 and runs through Jan. 28, but if you sign up now, you'll get instant access to a great welcome video from Robert Prechter, which sets up the event nicely and shows you a little bit about the unique approach he uses to forecast major market moves like he has recently in oil, gold and other markets. Follow this link to claim your invitation and watch Prechter's video now.